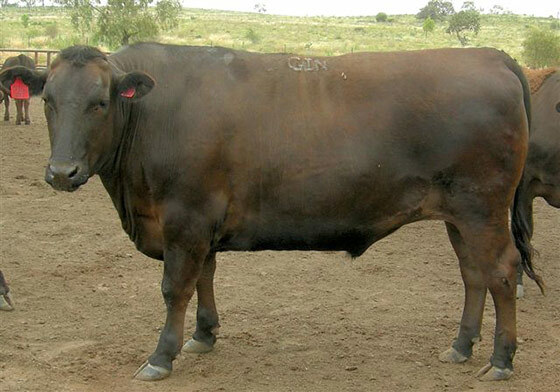 Although Japanese EBVs are based exclusively on carcass data and include no live animal measurements, the 2014 Australian Research EBVs stand out as a breakthrough in Western production of Japanese Blacks – the first time ANY Australian/international Wagyu EBVs have been based on actual carcass results. Critical: because in no other cattle breed is accurate prediction of carcass outcomes as economically important. The foremost objective remains accurate estimation of marble score or intramuscular fat (%IMF) – the single most important Wagyu carcass value determinant. Growth/carcass weight is the second most economically important trait. However, there are several steps to go to achieve demonstrated carcass parity in the highly competitive global market in which most Australian FB Wagyu product is distributed. Crucial traits measured by the competing Japanese Meat Grading (JMGA) system include yield, marbling fineness, REA, texture, fat colour and more, some entirely missing from the AUS-MEAT ‘language’ currently used for most Australian FB carcass assessment. First, consideration is given to a potential ‘misrepresentation’ that arises directly from the first stage of the GEBV project. 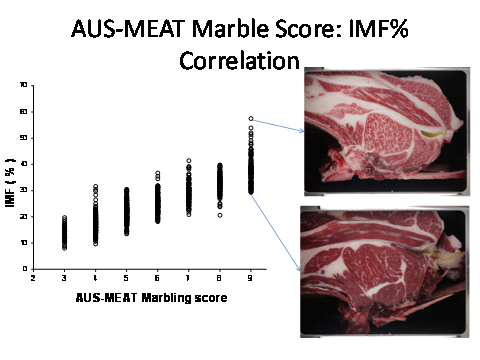 This is founded in early research correlations established between Australian (AUS-MEAT) chiller assessment MS1-9 marble scores and the lower levels of the new Research EBV marbling measurement values – expressed as % Marbling Percentage (CCMP -Camera Carcass Marbling Percentage) scores. These were acquired with purpose-built Japanese digital camera technology, designed by Professor K. Kuchida, in the first stage of the genomic project carcass study, and the camera use is ongoing in the project. The same technology is used in Japanese home market carcass grading. Under standard AUS-MEAT assessment, good XB Wagyu marble scores average around AUS-MEAT MS4-6, infrequently higher, with FBs most commonly at the top MS9 value. However, the inadequacy of AUS-MEAT to measure the higher levels of FB Wagyu marbling is such that the entire upper 30% range of CCMP values is necessarily condensed down into just one available score: AUS-MEAT MS 9. When this approach is used simplistically and without detailed explanation, as in the 2014 Sire Summary, a graphic/table representation suggests that XB carcass marbling outcomes (with accompanying much reduced $$ production inputs) successfully compete with fullblood carcasses. In the 2014 Research EBVs Sire Summary document, this deception is exacerbated by the apparent inclusion of purebred and XB carcass data throughout the listings, then compounded by the unexplained inclusion at high ranking of a number of sires/progeny carcasses with no CCMP (camera image) records, but only truncated AUS-MEAT carcass assessment data. Obviously, the inclusion of these non-camera records in the Summary is solely enabled by the use of AUS-MEAT values for marbling rankings. The outcome is a questionable (marbling capability) ranking of sires. All this when an unquestionable CCMP ranking would have been readily enabled by using the (CCMP) camera image values published in an adjacent column. Subsequent to the publication of the Australian 2014 Sire/Dam Summary, Professor Keigo Kuchida, the previously-mentioned Japanese inventor of the digital imaging technology (including CCMP) used for the GEBV study, provided us with a series of graphics which he suggests more accurately represent comparative AUS-MEAT and digital camera analysis capabilities in assessing Japanese Black carcass performance. Professor Kuchida is also corresponding co-author of a recent CSIRO-published paper on Australian Wagyu marbling, which details AUS-MEAT MS limitations relative to CCMP. (See Maeda, Grose et al, 2014, CSIRO). Source: Prof. K. Kuchida, Pers. corres. 2014. The photography above clearly illustrates the 30% range of marbling percentage (CCMP) condensed into the single AUS-MEAT MS 9 value in standard Australian chiller assessment. All Australian FB marble scores are currently ‘dumbed down’ in this fashion by AUS-MEAT assessment through no fault of the system itself – it simply was not designed to assess Wagyu. 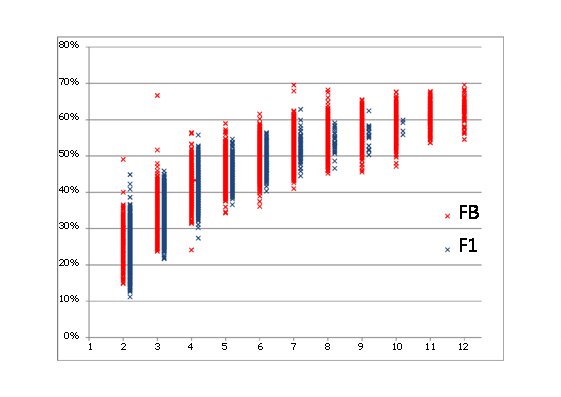 To provide a benchmark for comparative XB vs FB marbling performance in an environment where measurement systems are capable of addressing the range of marbling expressed, Professor Kuchida provided the following chart from the Japanese market, where the XB component comprises Holstein-cross feeders. Japanese JMGA BMS No’s 1-12 replace AUS-MEAT MS 1-9, but the CCMP (%camera marbling) remains constant. 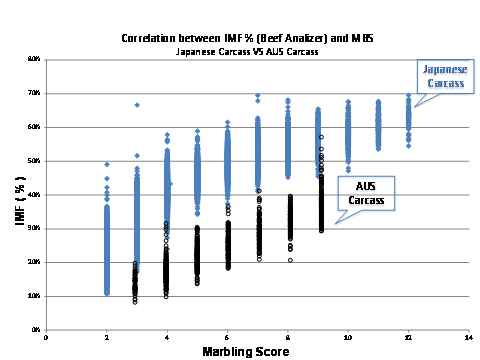 The chart shows the XB carcasses competing relatively strongly in single trait camera IMF% (marble score) with Japanese fullbloods across a significant range. However, what the chart does NOT show is positioning in the context of relative, overall JMGA grading. When all other JMGA trait measurements are taken into account, no Japanese XB carcass will grade above JMGA Grade B5. For the neither the careful producer nor the discriminating consumer, comparative overall quality is simply not there in XB breeding. For a look at how this translates into market $$$ value, see What’s a Wagyu Worth on this site. This a direct IMF%/marble score comparison of Australian fullblood carcasses with Japanese market fullblood carcasses with CCMP vertical axis and a JMGA BMS horizontal axis. The available sample of Australian fullbloods in the Kuchida study did not achieve the IMF % levels of Japanese carcasses. This suggests current difficulty in identifying internationally superior marbling stock for selection within local Australian herds, and also possibly the impact of ration and DOF experimentation to manage costs in the current Australian FB production environment. If nationally typical, the data shows that despite comparable genetics, Australian FB production is not so far achieving peak Japanese %IMF levels. As previously mentioned, Australian carcasses are not even being measured on most/other JMGA parameters such as fineness. So it might be argued that what the GEBV project has measured to date is a ‘way point’ in the development of the Australian fullblood industry – possibly a dangerous place for permanent benchmarks. Which is where we identify the final difficulty relating to the ongoing use of AUS-MEAT MS in the local Wagyu industry, and that lies in any suggestion that because of a GEBV project identification of a strong relationship between camera IMF% and AUS-MEAT MS, the local industry should simply hang its hat for future ‘grading’ on the current parameters of AUS-MEAT assessment. This might be a harbinger of disaster for the fullblood sector. More discussion of new vs original generation EBVs, Japanese camera data is available below.